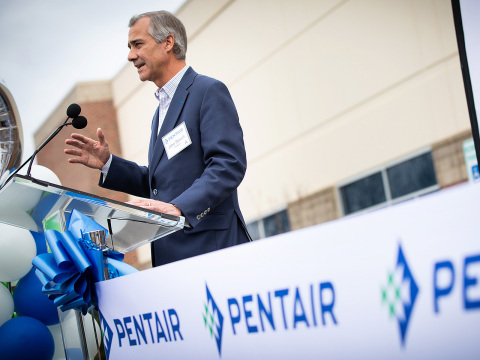 APEX, N.C.--(BUSINESS WIRE)--Pentair, a leading global water treatment company, has opened a state-of-the-art innovation center in Apex, N.C., advancing the company’s commitment to innovation and digital transformation in delivering smart, sustainable water solutions for swimming pools and water treatment solutions. The innovation center will primarily serve as the technology center of expertise for Pentair’s Aquatic Systems business. The 50,000 square-foot site includes an advanced electronics and IoT lab as well as extensive environmental and physical testing capabilities. In addition, the center includes both in-ground and above-ground swimming pools that bring complete product testing and integrated pool systems testing capabilities under one roof. Additionally, the innovation center features flexible space that can be configured to develop and design manufacturing cells. It will also facilitate rapid prototyping and make extensive use of 3D printing capabilities. Collaborative work spaces and ergonomic workstations enable a dynamic team environment. The center also houses a training room capable of live demonstrations and hands-on training for our employees and dealer customers. The Pentair Innovation Center was developed for Pentair by Keystone Corporation of Raleigh. At Pentair, we believe the health of our world depends on reliable access to clean water. We deliver a comprehensive range of smart, sustainable water solutions to homes, business and industry around the world. Our industry leading and proven portfolio of solutions enables our customers to access clean, safe water. Whether it’s improving, moving or enjoying water, we help manage the world’s most precious resource. Smart, Sustainable, Water Solutions. For Life. With approximately 130 locations in 34 countries and 10,000 employees, we believe that the future of water depends on us. Our 2017 revenue was $2.8 billion, and we trade under the ticker symbol PNR. To learn more, visit Pentair.com. 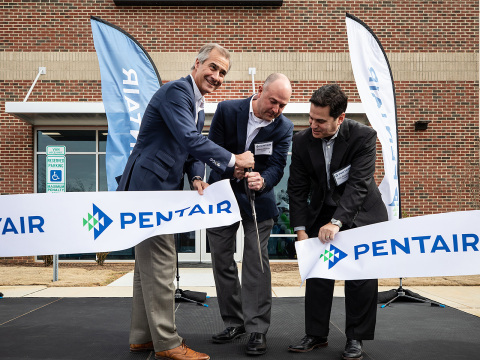 Pentair celebrated the opening of a state-of-the-art innovation center in Apex, N.C.